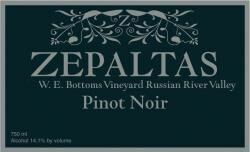 At Zepaltas Wines, the main goal is to produce wines that are balanced, pure and reflect the places and people who had a hand in making the wines what they are. Their favorite sources for fruit are the cooler parts of Western Sonoma County (Russian River Valley & Sonoma Coast), and the Santa Lucia Highlands in Monterrey County. Zepaltas winery tries to produce wines that go well with food, and have the potential to evolve into greater things throughout the aging process.